Buy Soma Online Us To Us We Play House Recordings is a young label. Belgian DJ Red D founded it in 2008 to showcase his favorite deep house. Soda’s singles make up half of the label’s output so far, so it should come as no surprise that Red D chose him for WPH’s first full-length. I’m reviewing the vinyl version, which features seven new tracks, but the CD will include five previously released singles as well as interludes and a bonus mix by Red D.
http://charlotteskitchendiary.com/category/recipes/breakfast-recipes/ The album begins with “Juno Love,” a sweet downtempo jam. Big, round bass glides under sustained, melodic chords. Plucked notes and tapped percussion make you want to sway along. “Something About Compression” is a short experiment with heavily processed strings over a hip-hop beat. The treble is so degraded, it sounds tense and frail. Rounding out the A-side is “Cocomo,” a slow-building (eight-minute) house track. The beat is crisp and simple. Gradually, syncopated notes take over with layers of reverberation. The deep walking bassline gets a solo as well. The flip side kicks off with another downtempo number. “Kylie Bling” is so chill it’s virtually lethargic. “Shouts in Peace” brings up the tempo, but odd, wordless vocals inspire visions of a moaning ghost. I guess I’m just not a vocals guy. “NMBSucks” is solid. Deep low notes pulse, then rest. A gentle melody slowly drifts over rhythmic piano notes. This is home-listening house. Lastly, “Timbapunk” is a tease. Speedy video game bleeps form a catchy melody over dramatic strings and intricate snares. In two and a half minutes it’s over, leaving you longing for more. 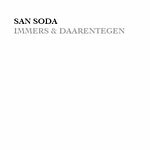 San Soda, like Shed on his new album, shows great versatility. I was surprised to hear so many nice downtempo jams. Also like Shed, Soda refrains from a direct Chicago or Detroit sound. I think that’s a good thing. This is the sort of album that is perfect pre- or post-club. Put it on in your car or living room to get you in the right mood.